Cedar Park’s Moonie’s Burger House is opening a third location at MoPac and Burnet, in the same shopping center as TacoDeli, at 12001	Burnet Road. Looks like the same spot as the failed Gabbi’s Burgers and Dogs occupied. Thanks for the info Brian, and thanks for the Cheddar update! Two varieties of cheddar–that’s even better. Will have to get by and give this location a try. 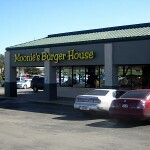 Stopped in for lunch at the new Moonie’s location today. They have only been open six days. The place was busy, almost all the tables were full. No problems with service though. Looks like they have it down. Order at the counter, they bring you the food. It’s a large restaurant (seems larger than their Cedar Park location). Nice space on the corner of the strip mall, so lots of windows. 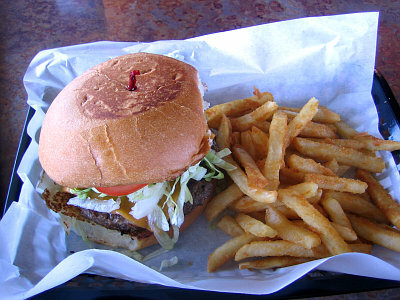 Burger and fries were about how I remember them from my first visit to their Cedar Park location almost two years ago. Bun is sweet. Patty is 6oz., griddled. Cheddar available. Fries are crispy-coated frozen-ish fries. Bun top-toasted. Overall, burger was OK, but very dry unfortunately. Bottom bun suffered from Dry Bun Syndrome, which did not help. Fries are good for what they are. Onion rings looked good but I did not try any (pricey at $2.99). So overall, a decent but not great burger in a pleasant atmosphere. A nice option at least to have up here in North 183 Land. Looks a little sparse on the mayo. 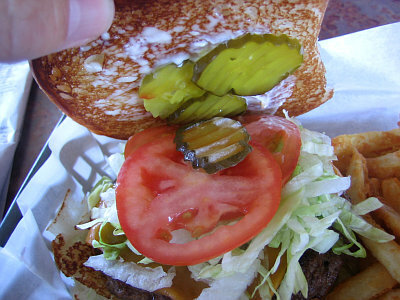 Do you feel obligated to leave a tip since they bring the burger out to you? No tipping required. Mayo level is a tad sparse, especially considering the overcooked patty, and bottom bun suffering from Dry Bun Syndrome did not help there. I concur with the mayo portioning. A little on the light side so the burger was a little dry but then I added ketchup, which I always love on a burger and it moistened it right up. I would have gone and asked for a little mayo but the line was too long. My only real drawback is the single register. The place was packed at lunch on a Saturday and they really could have used another at least for the rush. Although the line was long, it did move pretty well but they lost a lot of potential customers because they saw the line and went elsewhere. But the order to table time was quite reasonable. I went to the new location friday night and the place was packed. They did seem to fix some of the issues with wait time. They had 1 person writing orders and another ringing them. The line moved quickly and the food came out in less than 10 minutes. That was nice to see. As usual I thought the food was terrific. I also enjoy cheddar so I ate the bacon/ cheddar burger which was too much for me The taste was exceptional and i do love their fries. I had the burger, fries and a huge drink all for $7. I felt no obligation to tip. I would agree the atmosphere in the new one is very cozy ! I like the atmosphere and the singing trio on Wednesdays is unique. Management needs to do something about the long line during peak hours by adding a second register. There should also be a To-Go pick up line for orders that were called in ahead of time. The line is definitely the biggest issue and I’ve been there twice in peak hours and seen several potential customers leave due to the long wait in line. I guess I am the only one that found the fries to be not so tasty. Wow, I disagree….my entire family loves Moonies. One of the better burgers in Austin. I was a huge Moonies fan…then the Moon Pies disappeared! And the onion rings went to the wide side, not the nice 1/4 inch thick ones they had been serving…so I had to toss the entire order as they were much too wide. 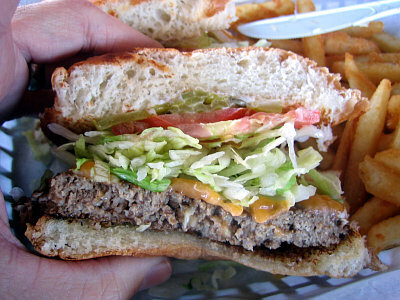 I love the Western Burger and the bun has a great flavor…but please bring back the original onion rings and MOON Pies…its is MOONies after all!! Yeah, Chris, I was less than impressed. Coke stations were flat and needed carbonation. Sweet tea wasn’t fresh. 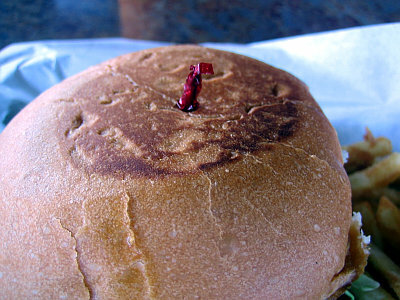 The burger was cooked somewhat on the rare side and the fries were greasy, greasy, greasy — made my stomach curl. Just not used to eating that much grease on a whole. Had the chili cheese burger and the chili cheese was cold and the onions were miniscule, if existant that the menu stated that it had. Only went there to meetup with my daughter and granddaughter. It’s not something that I would go to because I love to eat there. It’s okay. The environment inside has potential for a happening place to be, but they have to really get their act together on the cooking mode. 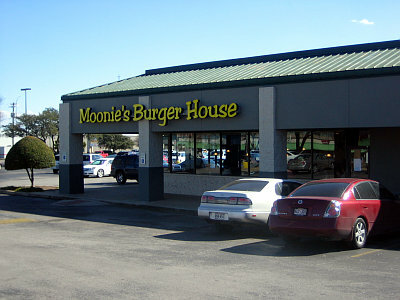 Drove by the new Moonie’s Burger House at Anderson Mill & 183 this morning and there is a “Now Open” sign out front. 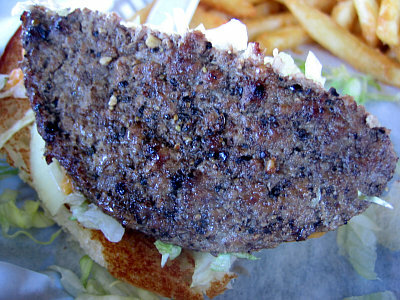 Postings on Chowhound indicate that Moonie’s Burger House of Cedar Park fame is opening a second location in north Austin, at 183 & Anderson Mill. This is good news for those of us up north. No word yet on when it will open. 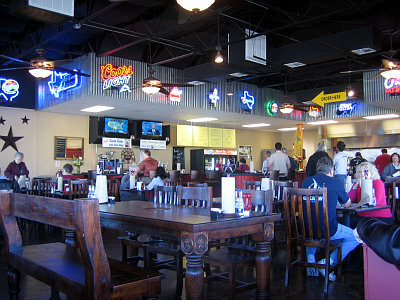 This is the location of the former ‘Rino’s and Jocks’ bar, located at the intersection of Anderson Mill Road and Highway 183.